“Music can in such a simple way help to overcome these feelings of frustration and humiliation. Music is the most effective and often the only way to stimulate a response. It seems to reach into their very souls and unlocks that door behind which a frightened, intimidated and humiliated person hides. Life at times is just too awful to face for most of them.” – Helena Muller, founder of Lost Chord, an innovative music charity. Most people enjoy music. For some of us it’s a major feature of every day, for others something to enjoy on a special occasion. Music, along with the TV, is one of the best resources for patients, who can engage actively or passively, in most emotional states, in most areas of the ward including the garden. Indeed, music is one of the best ways of helping patients manage difficult mood states. Like the weather, football and soaps, music is a great source of common ground for people whether it’s the pleasure of chatting about a shared love of Adele or learning about the roots of hip-hop. One of the many delights of music is that it can be enjoyed alone, or with other patients, staff and visitors, Skype even allows patients to share some music time with friends and relatives (including their kids) who are at home. And music is completely adaptable for occasion, mood and participants. Emotional state benefits including increased melatonin, a hormone associated with mood regulation, lower aggression, reduced depression and enhanced sleep. Other benefits: lowering blood pressure (which can also reduce the risk of stroke and other health problems over time), boosting immunity, easing muscle tension, improvements in speech. Personal preferences in music are very much shaped by our age, mother tongue and country or region where we grew up. The ward music library needs to reflect this, although there are of course teenagers who love Puccini and great-grandparents who love Puff Daddy, so it’s nice to have a range of styles. Religious music is very soothing for many people, and again the CDs or MP3 tracks available should be relevant to people from different faith communities. Musicals and pop classics are also very popular. The Trust has close links with a local community radio station. The Chief Executive has his own weekly show raising mental health awareness and interviewing star staff. The PIER (Psychosis Intervention and Early Recovery) team have a recording studio. Music in unit reception area! Lovely. Very welcoming. Older People’s wards, a record player and LPs of music enjoyed by their patient group. The Older People’s wards regularly hold informal tea-dance afternoons for patients and their family where war-time songs are played and everyone enjoys tea and cakes. Three units from the Older Adult Service hold a weekly Music Group in the Library. This provides opportunities for social engagement, dancing and singing. Once a month the CDs are replaced with a live singer and keyboard player who has collaborated with the patients to provide live music that they enjoy and a song book. Christmas carols with ex-patients being invited. “Jamming session”. There is a drum machine, keyboard, electric guitar and vocal recording equipment, available to use at whatever musical level the service users may be at (professional or experimental!!). The group is facilitated by an OT and a sessional worker – who makes the recordings happen. The service users are encouraged to utilise the instruments at the level they know or they can learn how to play an instrument. There is also an opportunity to sing or rap over backing tracks, either with written lyrics or in a free-style format. The group has created both individual songs and collaborative pieces with everyone playing instruments. Amazingly, the hospital has its own recording studio where patients can make their own CDs or demo tapes. Despite complex copyright laws, people can make 1 copy and the hospital is exempt from the Performing Rights’ Society license because the CD is used for therapeutic purposes. For patients who want to do serious practice and composition, the computer room has a keyboard connected to a computer. Music encouraged without disturbing others. music group available. Headphones provided if safe for patient. Offering a choice of music for relatives visiting a very quiet (even asleep!) or distracted patient. All patents are provided with CD players on admission. We have a synthesizer out at all times for anyone to access. It’s usually used with headphones but occasionally for all to hear. Great spontaneous, interesting and self-soothing resource. We try to make the guitars freely available on the ward as much as much as possible. I write raps. A member of staff let me use YouTube on his phone to practice rapping to instrumentals. A wonderful member of staff sang to me which helped me focus away from my voices. When I felt like self harming I would listen to my favourite music on my iPod, which usually worked for me. I used the ward computer to watch my favourite band on youtube. It was great to be interested in music again and doing something I really enjoy. A patient had a guitar and we had a good sing song. I haven’t done anything like this for years – it really lifted me. We had weekly karaoke nights. I used to listen at first but then decided to “have a go”. I didn’t realise I could sing and it was good fun especially when the staff joined in. Sometimes when I couldn’t find physical freedom I used to create emotional freedom by just meditating or listening to music. It can be hard to find any headspace on the ward given that there are few rooms available. But I found ways to have personal space, like listening to my iPod. This was my form of healthy escapism. Singing, playing instruments, tapping a rhythm with a foot or finger, all great ways of creating music. Music-making can be seen as communication between the players, and between players and audience. It’s a bit like a dialogue – someone plays a note or a phrase or sings some words, and the other musicians respond to what they’ve heard and felt, as exemplified by jazz and jamming. Music is incredibly evocative, and often a real pleasure for people with dementia, although of course it can also bring up strong feelings of loss and confusion. A music session is an opportunity for these emotions to surface, be validated and soothed. There’s a whole bunch of different instruments well suited to being played on wards. Guitar – bit daunting for people who don’t play one, but fab for those who do and lovely for everyone else to sing, clap or even sleep along to. Boomwhackers produce musical tones when struck together, on the floor, or against nearly any surface. They can also be struck with mallets in different configurations, in specialized holders (homemade or available from the manufacturer), similar to a horizontally-aligned xylophone. Boomwhackers are often used by performance artists and other musical performance groups to add an element of spectacle and are ideally suited to group and audience participation. And of course there are all the fantastic music programmes on the PC and Wii. From ‘background music’ (eg radio) being appropriate to age and culture of ward patients, to music appreciation sessions where patients, staff and visitors share music they like and people can discuss their own responses to it. Very simple, very lovely. When people feel confident about this (which might be instantly! ), they might like to do a similar exercise but with a piece of music unconnected to a particular story. It’s interesting to compare emotional expression in music across different styles, including music from across the globe. Some can be popularly (and accurately or not) thought of as inherently, necessarily having a certain mood – eg country and western is quite twangy. This sort of activity can branch off in any direction anyone fancies. Could be a discussion on people’s views of classical music, and other music types. Or people’s emotional relationship to music. What moves them? What soothes them? What energises them? Musicians usually love talking about music! Music groups and mealtime conversations benefit from enthusiastic and knowledgeable patients, staff (including admin staff, senior managers, doctors, catering staff) and visitors. One ward discovered that the guy from the mail-room who brought in the day’s post is a skilled guitarist. He was invited to lead some music groups which were really popular with patients and also gave him a very satisfying new dimension to his work in the hospital. Local music journalists, producers and musicians might be interested in doing a special session for a ward music group, and, as always, they’re much more likely to agree if they’re asked by someone who knows them. Youtube, Wikipedia, rock stars’ websites, social media music sharing, Google images…. Endless music related possibilities online. For example, Classic FM offer one at no cost. And Internet radio apparently exists. Star Wards’ music department hasn’t quite caught up with this but it sounds like a very good idea and something fun to explore, or even create, while in hospital. One of its big advantages is its globalness, which means that patients who come from, or just like, other countries, can listen to music that is particularly meaningful to them. This website has easy to use links with online stations around the world. Hugely popular, whether performances are by patients, staff, visitors or professional musicians. We’re thrilled to see the growing number of hospital choirs and bands made up of both patients and staff. There are charities which put on concerts in hospitals, eg Music Spaces and Music in Hospitals. 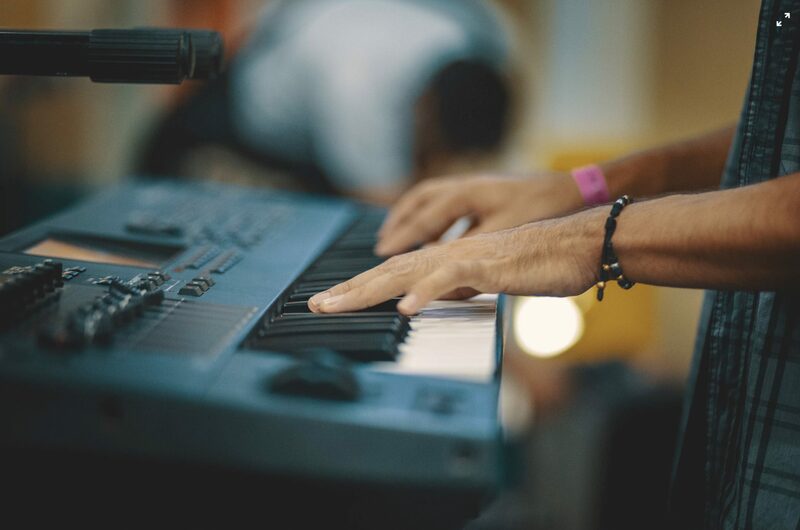 Local music colleges, classes, bands, ensembles are always looking for opportunities for their keen musicians to have an appreciative audience. And for those hospitals which have bands, nice reciprocal arrangements can be made. We strongly recommend, OK we see as pretty essential, individual portable music machines for each patient who would like one, with a choice of music, audio books, soothing/relaxation/nature music/sounds. This could be via a ‘loaded’ MP3 player or CD player + discs. Patients for whom it is safe should be able to have their own radio to listen to, with headphones if necessary. Some patients bring in their own MP3 players and it’s nice to have one or two docking stations or speakers so that they can share their music with other people if they’d like to. Cornwall Partnership Trust have launched a podcast studio, which can be used by members of the public to inform and educate others about their experiences of mental health issues and services. There has been a considerable amount of interest in the studio and it has already been used by many of the hospital’s clients. The first podcast, launched on 14 January, is entitled “What is depression?” and is aimed at staff, patients and the general public to help inform people about various mental health problems and the services that may be available to them. Podcasts are also available on CD and have involved staff, patients and carers in their creation. In order to make it easier for people to tell their story, Tim Carthew, Paul Tyler (both Social Inclusion Workers with CPT) and Andy Jago (Lead Nurse), have worked together, with funding via Pentreath Ltd, to create a studio on the Bodmin Hospital site. People can use the studio and its equipment via a booking system. Here’s my soothing playlist, in its correct order for me! I find repetition very soothing if I’m not in a good state. Repetition within tunes – eg Le Onde by Einaudi. And sticking the Repeat One button on and listening over and over and over to the same song. Again and again.